Nagpur, Nov 27: Indian captain Virat Kohli not only piles on Test hundreds but also scores them at a brisk pace making it difficult for most of his peers to match, concedes Cheteshwar Pujara, who himself is an epitome of consistency. 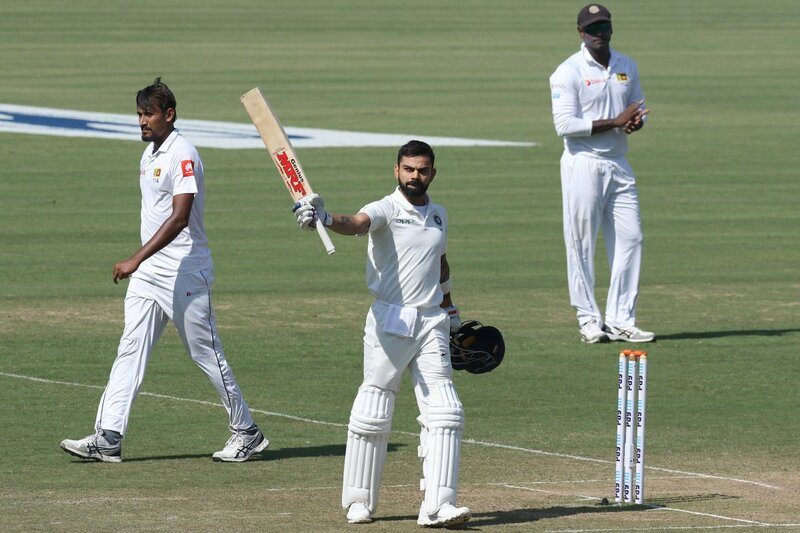 Four Indian batsmen has scored four hundreds in the second Test against Sri Lanka here but it was no-brainer that Kohli stood head and shoulders above the rest. Opener Murali Vijay's 128 off 221 balls was made a strike rate of 57.91. Pujara's 14th Test hundred -- 143 off 362 balls -- had a strike rate of less than 40 (39.50). Rohit Sharma's 102 off 160 balls was scored at a rate 63.75 while Kohli's 213 off 267 balls came at an impressive rate of 79.77. Asked why other players could not score at Kohli's pace, Pujara admitted that matching his captain can be extremely difficult. "See, he (Kohli) is a kind of player who performs well in all the formats of the game and the way he started off, if there was some other batsmen, I don't think they could have started in the same way. I think it's his confidence and way he is batting, in last two to three years, it would have been difficult for any other batsman to score at such a strike rate," Pujara said in a glowing tribute to his captain's capabilities. Pujara said that it was a "difficult pitch" not from batting perspective but certainly when it came to scoring runs. "Kolkata was different wicket altogether with a lot of assistance for fast bowlers especially in the first innings. Coming to this particular wicket, I think, it was difficult to score runs as this wicket was on the slower side. It was not easy to get boundaries and we had to rotate the strike," he said. "Whenever we got some opportunities, we tried playing some shots. But overall, it was a tough pitch, where you might not get out but it was also difficult to score runs," Pujara said, assessing the conditions. The hallmark of Pujara's game has been batting for long hours and he attributed it to better recovery and improved fitness. "I think for the last one and a half to two years, I have been working hard on my fitness and luckily there has not been any sort of injury. I am fully fit and that's the reason I am able to take quick singles and doubles. Even my recoveries are much better now when it comes to fitness," said Pujara. "So while batting, I have not changed anything but in terms of fitness, I have improved a lot. If you want to be on the field on all five days, you need a lot of stamina and your fitness has to be on top." Pujara feels that the experience of two previous tours of South Africa (2010 and 2013) along with his experience of English County has been of immense help as he prepares for his third trip to the Rainbow Nation. "The first Test starts on January 5, before that there's plenty of time to prepare. Personally, county experience and past South African experience will certainly help because I have improved my technique especially while playing in overseas conditions. Overall, I am very confident with the kind of form I am going through." The Saurashtra right-hander feels that simulating conditions similar to South Africa and England will certainly go a long way for the team to get better results while touring these countries. Asked if a few more practice games (India have only single two-day warm-up game) would have helped, Pujara said: "As far as practice games are concerned, I should not be the one commenting. It also depends on schedule and how BCCI plans its tour. But going there little bit early -- a week or 10 days early, and then practicing on those pitches are important. "Indian team is also playing other formats (ODIs and T20s), so if there are matches scheduled before we either go to South Africa or England, you can't help it, as an individual. You need to be prepared. Even if you are in India, we need to try and replicate wickets in South Africa and England and then try and practice here.